2. Tinsel can add a nice sparkling touch to the tree, but make sure you hang it up out of your pet's reach, or for the highest level of pet safety, simply don’t use it. Ingesting tinsel can potentially block their intestines, which is generally only remedied through surgical means. 3. 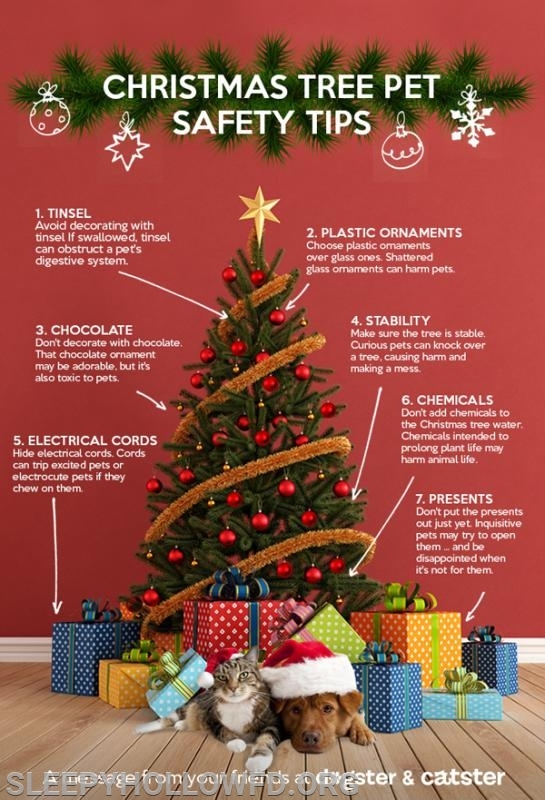 Do not put lights on the tree's lower branches. Not only can your pet get tangled up in the lights, but they can also cause burns on both cats and dog if they become entangled. Additionally, your dog or cat may inadvertently get shocked by biting through the wire. 5. For those buying live Christmas trees this year, keep the area around the tree free and clear of pine needles. While they may not seem dangerous, the needles cause stomach upset and can irritate or puncture your pet's intestines if ingested. 6. Did you know that holly and mistletoe are poisonous to dogs and cats? If you normally use these plants to decorate your home, they should be kept in an area your pet cannot reach. Poinsettias are also not a great idea, as they can cause nausea and vomiting if ingested. 7. Edible tree decorations—whether they be ornaments or popcorn strings—are pet safety time bombs waiting to happen. These goodies are just too enticing, and your pet will surely tug at them, knocking down your wonderfully decorated spruce. Not to mention that they are also choking hazards. 9. To prevent any accidental electrocutions, exposed indoor or outdoor wires should be taped to the wall or the sides of the house. Any wires extending away from the wall should be wrapped in hard protective plastic to make them less interesting to your cat.